A collective journey with a group of disciples always represented a highlight for me, specially during our annual Christmas trips that brought us to the farthest corners of the world. In January 2002 we visited Sabah, a little-known part of Malaysia, and while we were there we went on an old steam train. 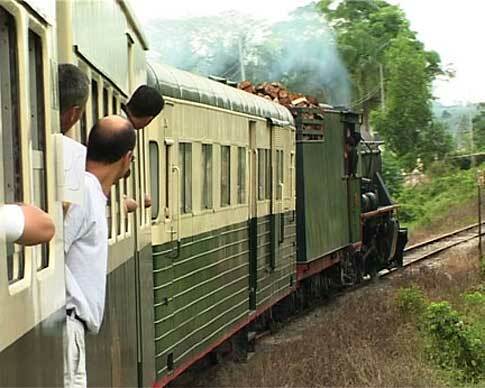 At the station, outside of Kota Kinabalu, I started to film the wood-burning engine. The workers of the North Borneo Railway were about to burn the wood in the same way that I did in my bake ry, Ecstasy-Sky, for many years. As usual, taking videos for me is not a duty but a passion and, as the train started to move, my immediate goal was to cover the journey with Sri Chinmoy and the feeling of experiencing the passing landscapes. I quickly ate my lunch and began filming at my table. Then I moved to one of the doorways, which had been opened en route, and started to capture the rushing scenes of smiling children and hard metal bridge pillars. After a short break at the final station, Putatan, the same train reversed direction. Once again I took the opportunity to take video from the doorsteps. I especially wanted to film a Buddhist temple which I had seen briefly on the outward-bound trip. I stood on the lowest outside step of the doorway and was ready to shoot when something seemed to pull me out of the train. Thanks to my Guru, I landed on my right side and survived the fall. It could have been much worse. I thought I was dreaming and said to myself that now it should be over, I have to wake up. But it was not a dream. My right arm was hurting, my breathing was short and I could hardly tell the villagers who had gathered around me what had happened. Luckily, two of my disciple friends, Sanjay and Prabuddha, rushed out of the train after it stopped (which was difficult by itself, because a steam train needs hundreds of metres to come to a complete standstill) and they were with me several minutes later. I was sitting on a little wooden bridge that connects the houses with the path crossing the railway and I was holding my arm. My camera was lying on the grass. I chanted “Supreme” as fast as I could, and afterwards in the car Sanjay encouraged me to even increase the speed. I did not want to die, and my friends gave me hope my Guru would help me. One of my ribs had punctured my right lung when I hit the ground, and the immediate goal was the nearby local hospital. When we arrived at the small g overnment-owned hospital, nobody seemed to see the need to treat me and, after a short time, our group doctor, Meghabhuti, decided to move me to a better private hospital. Here a very friendly surgeon with a Chinese background treated me and performed the first operation to inflate my lung back to normal with the help of a machine. This was the crucial moment for my survival, and only the constant powerful help of my Guru made it possible for my breathing to immediately return to normal. After less than three days, the lung tube was removed. Also, my whole right arm was crushed during the fall, and this was taken care of the morning after the accident with the insertion of an adjusting metal plate. In his career as a spiritual musician Sri Chinmoy played quite a few different instruments the most was in Interlaken, where he performed on 170 different ones. The range goes from classical instruments like the Indian esraj, the violin, the sitar or the piano to more spontaneous ones. One of these was the conch. This natural sound instrument of mother earth fascinated him so much that he himself often played it at the beginning of his peace concerts but also appreciated it very much if his disciples played it together in a large group on special occasions such as his birthday celebrations in New York on August 27th.